The FIFA Confederations Cup is a major competition in itself and earning a place at the event is actually harder for the national teams than qualifying for the World Cup, football stars Marcel Desailly and Harry Kewell told RT. The FIFA Confederations Cup “is not even a preparation for the World Cup. It’s a competition on its own,” legendary French defender Marcel Desailly told RT’s Neil Harvey and ex-Premier League player Stan Collymore, RT’s special host for the event, on the closing day of Confederations Cup Park in St. Petersburg. “For the players, the commitment with the national team has to be very high” at the event, which kicks off in Russia next month, the 1998 World Champion and double Confederations Cup winner added. Former Australian international and Liverpool midfielder Harry Kewell pointed out that earning a place in the Confederations Cup is an even tougher task than qualifying for the World Cup itself. “It’s a tournament that you don’t get to participate unless you’ve won a competition. Everyone is kind of blindsided by the World Cup. But you have to be a champion [of your FIFA confederation] to enter it. There are only a few teams that are actually able to participate [in the Confederations Cup],” Kewell said. The 2017 FIFA Confederations Cup, which runs June 17 through July 2, will bring together champions of FIFA’s six regional confederations: Portugal, Chile, Mexico, Cameroon, Australia, New Zealand, 2014 World Cup winners Germany and host nation Russia. 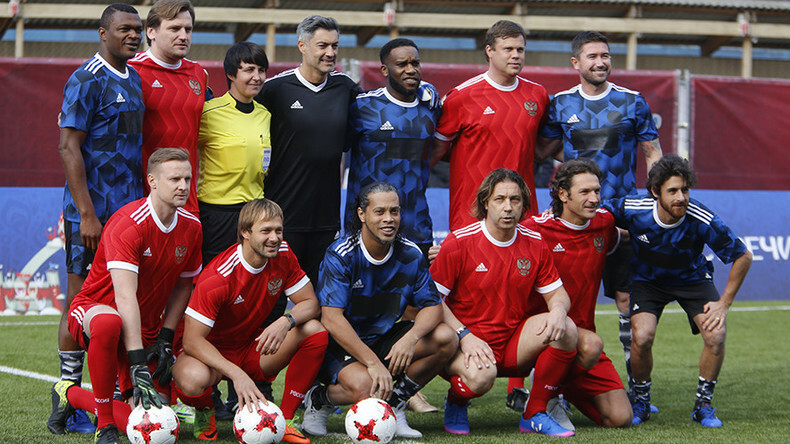 Desailly, Kewell, Ronaldinho and several other greats played a friendly match against former Russian national players at the Confederations Cup Park on Sunday. The 6-a-side game ended in a 9-9 draw, with hosts Russia claiming the win in a penalty shootout, thanks to a great display from goalkeeper Vyacheslav Malafeev. In the last three weeks, Confederations Cup Parks have also popped up in the event’s three other host cities – Moscow, Sochi, and Kazan – providing fans with a chance to meet their favorite players, see various football attractions, and check out the Confederations Cup trophy.